SuggestiMate solves the problem of information overload for organizations that use Atlassian Jira in their internal processes. One of the major problems with issue tracking is a big number of duplicates filed by users or QA people. Each duplicate bug takes time to describe, reproduce, investigate, resolve and report. This is time of several team members including development manager, QA manager, developer and QA person. This time is spent in wain because it doesn't add any value to the product you develop or service you provide. Another problem with the larger issue databases is the difficulty to see relations between different bugs. Newer team members don't know that a similar problem has already been resolved in the past and even experienced professionals can't remember all the details of every resolved or postponed bug. 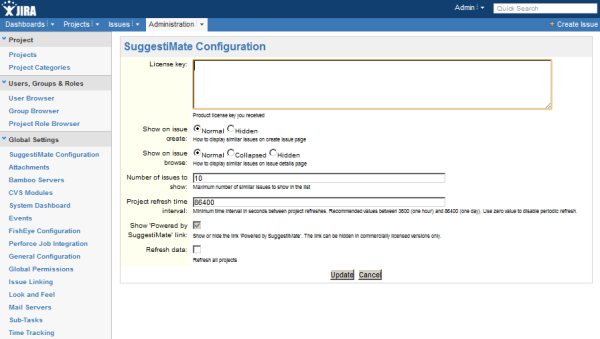 SuggestiMate provides you with an easily installable Jira plug-in that resolves the problems described above. It adds custom fields to issue browsing and editing pages which show you potentially duplicate or simply similar issues. The issues are loaded and displayed dynamically when you write new issue summary. The list of suggestions changes while you are typing. This way you see similar issues before you even create a new one and save time and resources on duplicates that don't get created. You also see related, similar or duplicate issues when you browse existing issues. On an issue view page you can see issues relevant to the current issue. Duplicate or simply similar bugs will be on this list. Looking through the list you get the big picture seeing immediately relation between issues. You can specify what exactly to display, how many issues you want to see and how frequently you want to make refreshes. This allows you to tune SuggestiMate to provide the best results for your organization. 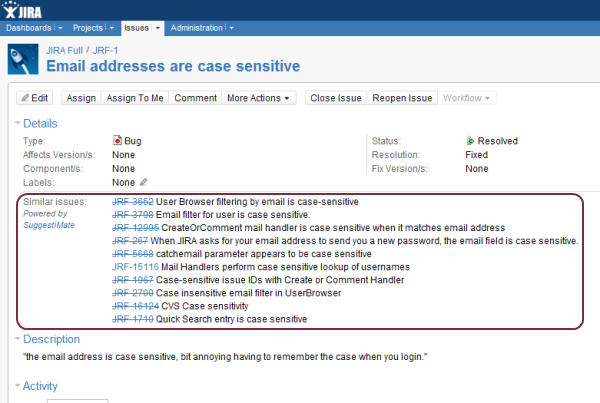 We support all Jira versions starting from 5.0.1. If you use an older Jira version and still want to install SuggestiMate for Jira, please tell us, and we will figure something out. The best way to experience the benefits of SuggestiMate for Jira is to install it freely and give it a try today.